CAPE CANAVERAL, Fla. — Shuttle Columbia safely flew into Earth orbit Thursday, the start of a marathon 16-day mission in which seven astronauts will work around the clock in the name of science. Israel's first spaceman, Ilan Ramon, was aboard NASA's oldest orbiter as the vehicle lifted off from the Kennedy Space Center right on time at 10:39 a.m. EST (1539 GMT). Tens of thousands of spectators who had gathered along Florida's Space Coast amid tight security watched as the 18-story-tall shuttle cruised out over the Atlantic Ocean and climbed through clear skies toward space. Concerned about potential terrorist acts in light of Israel's prominence on this flight, NASA and local authorities worked together to ensure the safety of those on and off the space center. No serious incidents or security breaches were reported. Eight-and-a-half minutes after blast off Columbia's main engines were shut down and the external tank jettisoned. More than two years after they were selected for this flight, the crew flying NASA's oldest orbiter finally made it into space. Originally targeted for launch in July 2001, the astronauts and scientists involved with STS-107 — NASA's designation for the mission — have had to endure lengthy schedule delays caused by fleet-grounding technical problems and higher priority shuttle flights. But once the countdown finally began Sunday night, everything happened like clockwork. There were no technical problems and the weather cooperated. "If there ever was a time to use the phrase all good things come to people who wait, this is the one time," launch director Mike Leinbach told the crew just before liftoff. "From the many, many people who put this mission together, good luck and godspeed." "We appreciate it, Mike," replied Columbia commander Rick Husband. "The Lord has blessed us with a beautiful day here, and we're going to have a great mission. We're ready to go." Once in space, the crew were to immediately get to work, setting up the shuttle as an orbiting platform for science research. Columbia's voyage — the 28th flight for the orbiter and the 113th for the shuttle program — is the first flight not going to the International Space Station since the same shuttle hosted a Hubble Space Telescope servicing mission in March 2002. "This mission is fairly unique compared to the shuttle flights we've flown recently in that it is a dedicated science mission," said Kelly Beck, lead flight director for this mission. "It will span multiple disciplines, such as the life sciences, physical sciences, Earth and space sciences as well as the educational arena." Altogether there are 86 payloads that will support 79 science experiments and investigations in the fields of biology, physical science, advanced technology and Earth and space sciences. "We have a smorgasbord of experiments. There's no one principal focus with all of the payloads that we have on board," said Columbia pilot William McCool. To fully take advantage of their resources in orbit, the crew will split into two shifts to work 24 hours a day. Husband, Ramon and mission specialists Kalpana Chawla and Laurel Clark will be on the red team that works the day shift based on Houston time, while McCool and mission specialists Mike Anderson and David Brown will be on the blue team and work the overnight shift. "We'll be very, very busy. This is a jam-packed 16 days on orbit," McCool said. "And if it were a jam-packed eight days on orbit, I just wouldn't have any time probably to look out the window. So, at least this way I get an opportunity to smell the smells, see the sights, write down some notes." In addition to the seven humans, a menagerie of critters will be participating in the experiments including rats, fish, silkworms, spiders, ants and even some bees. 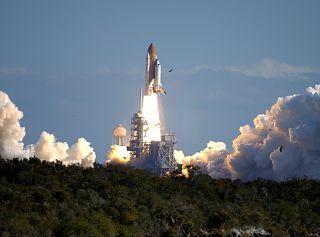 The studies deal with topics such as preventing kidney stones, improving construction techniques when building on sandy soil, how the ability to smell changes in space, as well as the usual assortment of shuttle experiments such as those involving crystal growth. One experiment that is getting a lot of attention is the Mediterranean Israeli Dust Experiment (MEIDEX), which is the scientific reason why astronaut Ramon is flying this mission. Although he has trained to work on many of the other experiments, his main job will be to keep an eye out for dust storms on Earth. The MEIDEX experiment involves pointing a special camera at the dust in the atmosphere and taking pictures, while at the same time aircraft will attempt to take measurements of the same area of the sky at the same time. "Together with a lot of ground station measurements, the scientists are going to analyze this data after flight, post-flight, and try to better understand the impact of the dust on our global climate," Ramon said. The MEIDEX hardware also will be used to look for a form of lightning called sprites — statistically one sprite fires off above a thunderstorm somewhere in the world every second, Ramon said — and to test the astronaut's ability to see specific objects on the ground at extreme slant angles. Much of the work will be done inside a pressurized SpaceHab research module that is tucked inside Columbia's cargo bay and connected to the crew cabin by a tunnel. Also in the bay is a pallet of experiments called Freestar. SpaceHab, Inc., built the Research Double Module being used for the first time on this flight and leased it to NASA. As part of the deal, the company sold 12 percent of the experiment space to commercial customers. Columbia is to remain in orbit until Feb. 1, with a planned landing back at the Kennedy Space Center at 8:49 a.m. EST (1349 GMT).